This week sees the launch of Creative Tourist, a wordpress-based online magazine about our fair city's arts and culture from the Manchester Museums Consortium. Issue 1 features Jeremy Deller, Ansuman Biswas (better known as the Manchester Hermit), Marina Abramovic in conversation with Whitworth Art Gallery director Maria Balshaw, Andrew Shanahan's guide to the best videogames ever, and Dea Birkett writing and ranting about children in galleries, among other things. 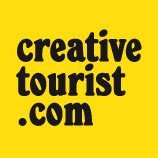 Creative Tourist's main features will be published monthly but the idea is that the website, blog and twitter feed will keep up a steady stream of interesting content. I will be helping out Editor Susie Stubbs with the words, cruisin' the local blogsphere for tasty bits to link to and commissioning guest posts from Manchester's finest culturebloggers. If you're one of them, please don't be shy. Get in touch and let me know what you're doing and you may be linked to in a blog roundup or be asked to pitch in and write something, like Katherine Woodfine of Follow The Yellow Brick Road, who wrote up Procession for the Creative Tourist blog. Anyway, back to work: Root beer or cherry?